Rural industries and structures associated with turnpike roads and railway superimposed on landscape of scattered large farms in area of post-medieval enclosure of meadow land. The earliest evidence of activity is represented by a cremation cemetery of probable Roman date just to the north of Pontruffydd Hall, but no evidence of settlement of this period has yet been identified in the area. The area falls within the medieval ecclesiastical parish of Bodfari and falling towards the northern end of the commote of Dogfeilyn, in the ancient cantref of Dyffryn Clwyd. Flat or gently sloping land along the narrow valley of the Afon Chwiler, where it runs through the Clwydian hills, and the more open area of the vale, near Pontruffydd Hall Farm, at the confluence of the Clwyd and Afon Chwiler, rising gently from about 25m OD on the west to about 60m OD on the east. The Aberchwiler valley itself was described by Pennant as 'narrow, fertile, diversified with groves, and watered by the crystal Wheeler' (Pennant 1783, 27). The eastern side of the area forms part of the Clwydian Range AONB. Evidence of early settlement is limited to Pontruffydd Hall, one of a number of larger late halls on the lower-lying ground in neighbouring area, formerly a 16th-century structure, was replaced by a gothic-style rendered house in the 19th century, together with various other gothic features including a gothic arch and an ornate entrance lodge, a brick walled garden, stable block and other outbuildings, rendered or in brick the farm attached to the being described as a 'pretty ferme ornèe' by Pennant (1783, 31), together with elements of a model farm. 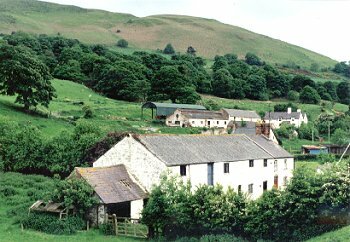 18th- to 19th-century farmhouses and outbuildings at the neighbouring smaller farms such as Geinas Farm are predominantly of brick, though some earlier stone buildings survive at both Geinas and Glan-Clwyd farms. Settlement in the narrow valley to the east is largely restricted to 18th and 19th-century buildings built along the turnpike road including roadside inns, water-mills and forge along the Afon Chwiler, and other structures associated with the Mold & Denbigh railway. The nucleated settlement at Waen Aberchwiler appears to be of 19th-century date, enlarged by 20th-century housing, the Welsh Calvinistic Presbyterian chapel at the focus of the hamlet having been first erected in 1822 and replaced forty years later. Land-use characterised by medium to large-sized pasture fields, with wetter lower-lying ground along banks of the Clwyd and Afon Chwiler drained by drainage dykes though parts of the southern side of the area are still seasonally flooded. Fields generally defined by either post and wire fences or by quickthorn hedges. Small stands of deciduous and conferous woodland to the south of Pontruffydd, and other scattered taller alders, willows and poplars along the banks of the Afon Chwiler. Some land of parkland character around Pontruffydd Hall. The landscape probably reflects late medieval drainage and enclosure of low-lying meadow land. The valley of the Afon Chwiler cutting through the middle the Clwydian hills, from early times formed an important line of communcation between the vale and the areas to the east, being the route taken by the turnpike road in the 18th century and the railway in the 19th century between Denbigh and Mold, both crossing the Clwyd by means of stone bridges near at Pontruffydd. The Mold & Denbigh Junction Railway was in operation between 1869-1968, with a station at Bodfari and sidings for the Partington Steel & Iron Company at Bodfari in 1924 (Baughan 1991, 76-9). Like the turnpike road the former railway still forms an important landscape feature within the area, gradually becoming invaded by silver birch and alder. Water power provided by the Afon Chwiler was harnessed during the 18th and 19th centuries, if not earlier, and still represented today by the extant former stone-built clover mill (for extracting clover seed) known as Candy Mill and the brick-built corn mill at Geinas, both fed by mill races drawn from the stream. Water power appears to have also been used at for a forge at Forge Farm and possibly farm machinery at Pontryffydd Hall Farm, where leats are visible. A brick chimney at Geinas farm appears to belong to an engine-house driving farm machinery. The building, in which the operations are carried on, is in form of a crecent: a beautiful arcade four hundred feet in extent, with a loggio in the center, graces the front; each end finishes with a pavillion. The drying loft is an hundred and eighty feet long; the brown warehouse and lapping room each ninety feet; and before it are five fountains, a prettiness very venial, as it ornaments a building of Dutch extraction. But this is without parallel, whether the magnitude, the ingenuity of the machinery, or the size of the bleaching ground is to be considered. The greatest part of the linnen bleached here is sent from the tenantry of his great estates in Ireland, in payment of rent. Much also is sent by private persons from the neighboring counties for the mere purpose of whitening. The vast extent to which Mr. Fitzmaurice carries this business, is most sensibly felt in this neighborhood. May the utility of his life effectually awaken in our gentry a sense of his merit, and the benefits resulting from his labors, and induce them to promote every design of his, calculated for the public good. The site of these extraordinary Palladian buildings, 'one of the very grandest of C18 industrial buildings' (Hubbard 1986, 80), are visible as earthworks at Coed y Plain, and were probably approached by the causeway known as Hen Ffôs, to the east of Aberchwiler. Two contemporary illustrations of the bleach works are known, a watercolour by Moses Griffiths of about 1790, and a line engraving by W. Watts after T. Sandby (the architect) entitled 'Bleach Works at Llewenni, as at first intended to be built'.